-Develop Android and iOS app using single codebase. -Do more with less code, even on a single OS, with a modern, expressive language and a declarative approach. -Experiment by changing code and reloading as your app runs (with hot reload). -Fix crashes and continue debugging from where the app left off. -Flutter has an advantage of a rich set of Material Design and Cupertino (iOS-flavor) widgets built using Flutter’s own framework. -Realize custom, beautiful, brand-driven designs, without the limitations of OEM widget sets. 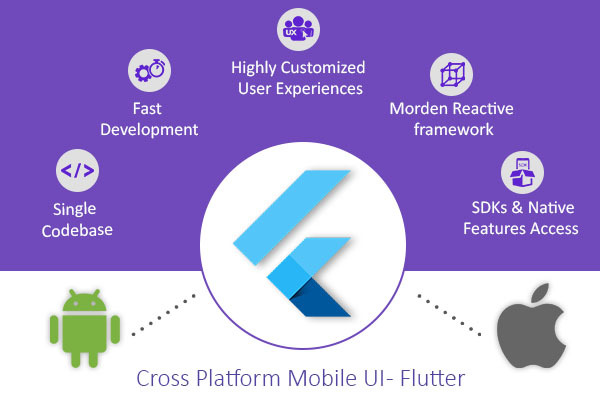 -Flutter can easily create UI with modern reactive framework and rich set of platform, layout and widgets. Solve your tough UI challenges with powerful and flexible APIs for 2D, animation, gestures, effects, and more. -Using Flutter, you can also use the native code 3rd party Sdk, APIs. Flutter lets you reuse your existing Java, Swift, and ObjC code, and access native features and SDKs on iOS and Android. Install and run the Flutter you must meet the minimum requirement. You can clone the beta branch of the repository, then add the Flutter tool in your path. You can set Flutter path temporarily as well as permanently. Below command is used to set the temporary path, for the current terminal window. The above command is used to check for any dependencies need to the complete setup. When you run the doctor command for the first time, it will download its own dependency and compile itself. When you run the command, it will display the following output in your cmd screen. visit https://flutter.io/setup/#android-setup for detailed instructions. If You have already installed the android studio. Then just set the ANDROID_HOME environment variable to android sdk path. Now we will setup the editor. With the Flutter command-line tool, you can use any editor to develop Flutter application. Type $ flutter help at a prompt to view the available tools. You can build apps with Flutter using any text editor combined with your command-line tools. Following steps are used to configure Flutter plugin to android studio. We required Android Studio version 3.0 or later. -The Flutter plugin powers Flutter developer workflows (running, debugging, hot reload, etc.). -The Dart plugin offers code analysis (code validation as you type, code completion, etc.). Open plugin preferences (Preferences>Plugins on macOS, File>Settings>Plugins on Windows & Linux). To run and test your Flutter app on an Android device, you’ll need an Android device running Android 4.1 (API level 16) or higher. By default, Flutter uses the version of the Android SDK where your adb tool is based. Connect your device using the USB cable and turn on USB Debugging option. Run the command flutter devices to display the connected device list in terminal. Thereby, to run your app type flutter run command.